During our recent Cultural Detective Tenth Anniversary meetings and celebrations in Mazatlán, Mexico, some of those attending used a free hour in the program to walk out into the community to conduct short ethnographic studies—to practice their detective skills. Below is a summary of what interested one group. Click here for a link to the instructions for this activity; you are most welcome to adapt them for your own purposes! Just think how frequently we travel to very different places for work, and how often we don’t take the time to interact with the local people in ways that help us get to know them as people. The same can be said for the beautiful places we travel as tourists. Let’s make a point of practicing our Cultural Detective skills wherever we are, building cross-cultural respect, understanding, and friendship! The two portals of this private building reflect traces of a couple of Mexican values, and provide a thought-provoking contrast. Located in the Centro Histórico district of Mazatlán, these differing window images on the same building grabbed my attention due to their stark contrast and my reaction to them. In the eyes of many US Americans, the window on the right has an ornamental grate that is “obviously” there for self-protection. This may be due to the prevailing norm in most historically Anglo communities in the US, where the point is to organize the exteriors of houses, and the land surrounding them, for maximum street appeal—to look nice to the public. With this cultural lens, the iron grating over the window appears forbidding, almost like a jail gate. Looking inside this window through the bars, however, one sees a lovely interior courtyard. With a different cultural lens, one can appreciate that the beauty is saved for the inhabitants inside rather than displayed outside for the passers-by. This tradition is, of course, very ancient and not specific to Mexico, but is alive and very visible in the Mexican environment. Earlier in the day, we had been on the top of a hotel looking down into the Centro Histórico, and were able to see many other lovely “hidden” gardens surrounded by buildings and/or walls. In the photo above, the window space on the left, which has been plastered over, has a graffiti-style painting of a whimsical robot-like character, full of bright colors, dynamic angles, and high energy. 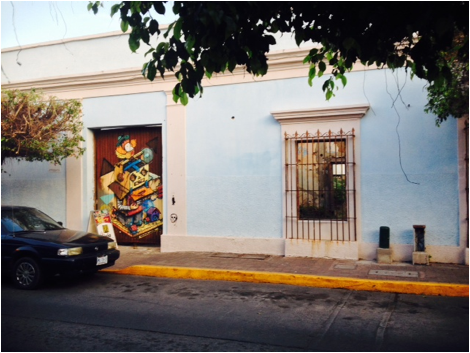 These sudden and unexpected bursts of playful creativity, color, and often-humorous social commentary, seem to appear frequently on the Mazatlán streetscape. The Mexican sense of design, decoration, ornamentation, adornment, and use of color and music appear to be a prevalent part of everyday life, even in the poorest neighborhoods or circumstances. On another level, such whimsical images as the one in the graffiti above often convey biting social commentary in an apparently lighthearted and ironic way. Other examples of this are the Día de los Muertos images and figurines, with charmingly dressed skeletons wearing flowered hats, jewelry, dancing shoes, etc. Investigating Cultural Detective Mexico core values using this image provides many possibilities. The value of Tradición (Tradition) is evidenced in both the old window and the new graffiti. The stability and sense of history provided by the old window is a subtle reminder that the past had value, and remains as the base upon which to build—even to build expression of an artistic nature! The bright colors of the graffiti echo the traditional colors of clothing, weaving, and handicrafts by many of the indigenous peoples of Mexico. So, in a sense, this newer form of artistic expression has a connection with the past, also. Another core Mexican value reflected in the photo is that of Posición social (Social position). Peeking through the grate on the window into the garden, one can only imagine its original splendor. The family who built the home had to be of some means, and the house reflects their social position. And now, a street artist has seen the plastered-over window as a canvas on which to display his/her work, a statement of her/his position in society as an artist. Of course, an interior garden may add to one’s ability to Sentirse agusto (feel good about someone or something) by providing a serene setting in contrast to the outside world. And dare we imagine that the artist also felt good about his/her creation—had a sense of Sentirse agusto upon completion of the work? This entry was posted in Downloads/free gift, Exercise/activity and tagged architecture, cross-cultural skills, Cultural Detective, graffiti, intercultural competence, Mazatlán, Mexico, street art, streetscape by Dianne Hofner Saphiere. Bookmark the permalink. Really nice comparison and analysis. I like how the initial contrast of the two windows is then transformed into an analogy. It is very interesting, thanks for sharing! The grated window with interior courtyard sounds like the Spain heritage, especially in the south. Interior courtyards were common with the Romans, and under arabic rule as well (think of the veiled women). The grates so common in Spain, security and an artform in itself.